Prize: One winner will receive a Minky Layette Blanket from their Layette Blanket Collection in Pink or Blue (a $54.99 value). Kivelli Baby has been setting the trend for babies and toddlers since their launch in 2007. They have a varied elective mix of different styles that will cater to all mothers style personality, whether you’re a rocker girl at heart or refined. Offering everything from the innocent tenderness of a delightfully sweet smelling newborn, to the charming little socialite princess, to the Sk8tr boy next door, you’re bound to find what you’re looking for. Their collections include travel blankets (perfectly sized for infant car seats), burp cloths, lux nap mats, blankets, memory foam stroller liners, bracelets, pacifier holders, bathrobes, bibs, and hooded towels. I usually strive to steer clear from prints and fabrics that are generic, blasé, or uninspiring, because I love anything that is unique and fashion-worthy. It was love at first sight when I first laid eyes upon the Punky Girl Blanket from their Funky Punky Blanket Collection ($69.99), because it is a feminine, yet edgy, mirror image of my own style. Not only pink and black are one of my favorite color combinations, but I love the argyle print. I also love cute skulls, because they’re edgy without being sinister and dark looking. It is definitely a blanket that would induce vigor in any nursery! The hot pink, light pink, and black goes well with my daughter’s current color theme of her crib bedding ensemble. The blanket is perfect for a stroll with your bambino, because it is rightfully sized for strollers at 30″X36. It features a super soft minky fabric, a black satin trim that gives it a sophisticated edge, and the Kivelli Baby logo is beautifully embroidered on the bottom left corner. 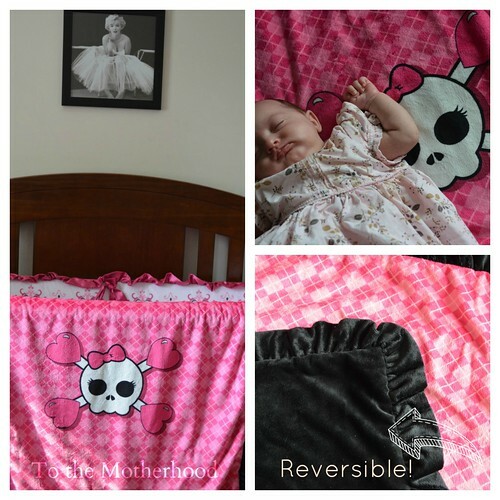 The Punky Boy is very much similar to the Punky Girl Blanket. The only difference is that it has a blue argyle print and features a skull with two guitars. You can stay in the loop by following them via Twitter, “liking” them on Facebook, and subscribing to their YouTube channel. zCush – More Than Just a Nap Mat!